A young man finds love in the midst of revolution. Fighting to restore the America of legend, Spartak Jones becomes one. By 2116, the war between the ruling elites is now full frontal and the seventeen-year-old has become its celebrity warrior and icon for an America that used to be. Kidnapped and taken as a trophy slave just a year ago, he remains his own man, willing to use his looks and other talents to survive and triumph. The liberal underground promotes his wholesome yet swashbuckling image to build support for democracy even while others plot for his destruction. Love may be his greatest weapon. Is he a pawn or hero? How much evil is acceptable if you believe your cause is just? From the Space Elevator, 22,000 miles above the earth, Spartak and Zinc McClain, scion of the nation's richest family, launch an audacious scheme to thwart a religious war and a military coup. 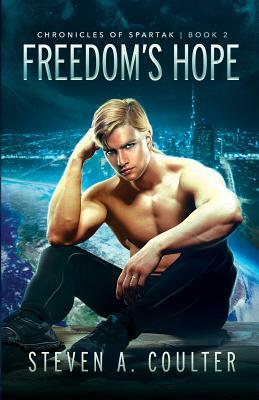 Fast-paced, disturbing, heretical, uplifting, and ultimately romantic, the novel weaves science fiction, fantasy, politics and a strapping hero telling his own story.